Online Restaurant Training from Service That Sells! trainingGrid™ is designed to help you grow your greatest investment – your staff. The trainingGrid™ learning management system streamlines training and administrative tasks, giving managers and employees more time to focus on customer service and profitability. Choose industry-specific online learning from our library, bring your own content, or let us build custom training just for you. Supervise and document employee progress toward critical training goals with easy-to-use learning management functions. Give employees the knowledge they need to succeed in their current roles and advance on their own unique career paths. 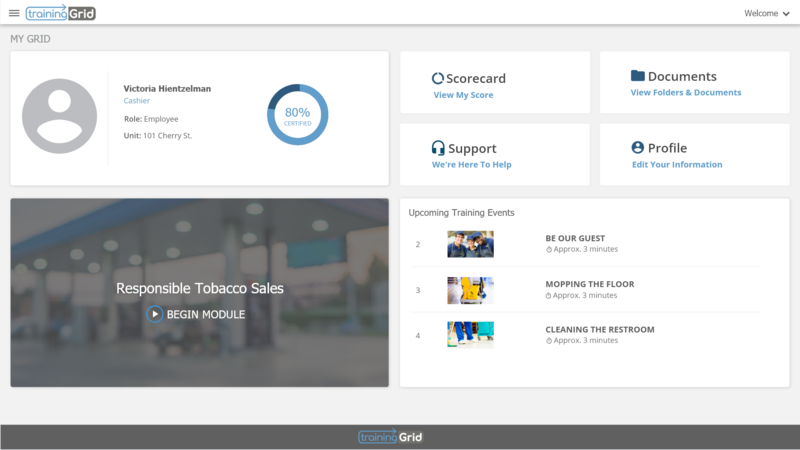 Our trainingGrid™ learning management system delivers the training your employees need and the administration tools you want. Powered by Ready Training Online, trainingGrid™ is backed by more than a decade of online training know-how. Create personalized training programs based on employees’ company roles and career goals. Improve learner engagement and knowledge retention with objectives-based quizzes and exams. Know in real-time how your staff or an individual employee is mastering essential training topics. Blend online learning with on-the-job training and sign-offs tracked in trainingGrid™. Leverage your current training – trainingGrid™ supports SCORM content and other various formats. View all your online training activity at a glance with our adaptable and user-friendly calendar. Streamline all training phases by storing important documents in your learning management system. Encourage training implementation with customizable guides employees can use on the job. Demonstrate training completion and employee achievement with printable certificates. With a diverse workforce that’s on the move and located across the globe, your training must be consistent, concise, and trackable. Our trainingGrid™ online learning management system is your answer. Our Client Success team is dedicated to helping you become the hero of your company during the legacy of our relationship. From solution design and implementation to system training and continuous support, we’re only successful if you’re successful. Our experts will help you design and develop a training solution specific to your needs. Our team will guide you through each step of the configuration and implementation process. Rest assured with your dedicated account manager focused on continual improvement. Our in-house tech support team is ready to assist any need via phone and email. Request a comprehensive guided demonstration of the trainingGrid LMS™.